BULAWAYO: Opener Fakhar Zaman has become the first Pakistani batsman to enter the 200 club in One-day International cricket when he scored an unbeaten 210 runs against Zimbabwe. Zaman together with Imam-ul-Haq catapulted to the top with their staggering performance for scoring the highest opening ODI partnership after their captain Sarfraz Ahmed won the toss and decided to bat first in the fourth one-day international against Zimbabwe on Friday. The duo made 304 runs to set a new world record of the highest opening stand, previously held by Upul Tharanga and Sanath Jayasuriya who had scored 286 against England at Leeds in 2006. Zaman remained not out on 210 to see Pakistan set the hosts a huge target of 400 runs as they already won the series with 3-0 up by virtue of crushing Zimbabwe in the first three games. 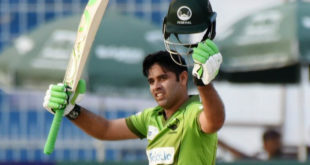 Zaman’s opening partner Imam also hit a century – 113 off 122 balls with eight fours and then allrounder Asif Ali smashed three sixes and five fours in his unbeaten 50 from just 22 balls in an unbeaten second wicket stand of 95 runs with Zaman. Zaman struck five sixes and 24 boundaries during his 156-ball stay at the crease. After Pakistan captain Sarfraz Ahmed won the toss and batted, Zaman and Imam quickly vindicating his decision, taking 59 from the opening Powerplay. Zaman was first to his 50 in the 18th over, from 51 deliveries, with a fierce drive through extra cover. He was also first to his hundred, in the 32nd over. It was the third ODI century in his career and his second in this series. Imam followed six overs later, while the world record for an opening stand fell halfway through the 40th over. Zimbabwe eventually struck when Imam top-edged a slog sweep off Wellington Masakadza´s left-arm spin to be caught in the deep, but Asif Ali ensured that the runs kept flowing. While Zaman raced to his double century in the 47th over, Ali smashed five fours and three sixes to reach a maiden international fifty from just 22 deliveries. He passes Saeed Anwar’s previous record for Pakistan of 194!